The latest summer heat wave is upon us, and it’s won’t be the last of the season. That’s why it’s vital to remember that exposure to intense and prolonged heat is dangerous to all creatures—of course including our dogs. Dogs can sustain physical damage and succumb to heatstroke in just 15 minutes—and heatstroke can be fatal. Dogs cool themselves only by panting and sweating through their paw pads; that’s a very small area to cool large dogs like German shepherds. In Southern California, the six-month window between May and October is the time for peak temperatures, which means owners must remain extra vigilant and watch for signs of overheating in their dogs and take extra precautions to ensure their safety. •	Older, overweight and longhaired dogs suffer heat stress quicker. Dogs still need exercise even when it is hot, but show extra care to older, heavier and shaggier pups that are more at risk from high temperatures. If you go for a walk or a run, limit exercise to early morning or evening hours when it’s cooler. Extra caution should also be taken with short-nosed dogs. •	When your dog must be outside, ensure there are plenty of shady spots for him to rest, and don’t keep him out for too long. Resting inside on cool tile or hardwood flooring is better than almost anything going on outside. •	Be aware of the temperature of concrete. When dogs walk on concrete or blacktop, it’s like they are walking on bare feet. If it’s too hot for your feet, it’s too hot for their pads. •	Provide adequate water at all times and keep it in the shade. There are products that help keep water cool, as well as products that make huge dog “pupsicles” that can contain favorite toys or treats. The dog licks the ice away to reach the treasure inside. Or make your own in the freezer. •	Consider filling a kiddie pool or get a misting line for the backyard. •	Don’t leave water out for too long. 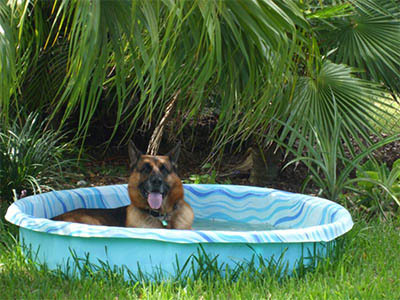 Change it often to prevent your dog from getting sick from bacteria that can grow in hot water. 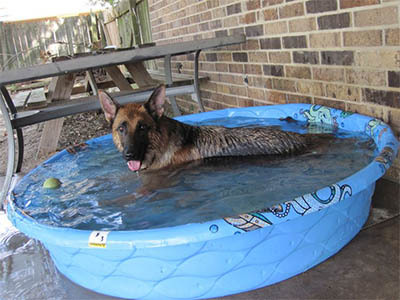 •	A pool or frequent beach trips are both great ways to cool down, but don’t leave your dog unsupervised at any time—not all dogs are good swimmers. Introduce your dog to water gradually and make sure they wear flotation devices when on boats. To remove salt from their fur, rinse your dog after swimming in the ocean. •	If you see a dog left alone in a hot car, record the car’s color, model, make and license plate number and have the owner paged in the nearest buildings, or call local humane authorities or police. Always have someone keep an eye on the dog and don’t leave the scene until the situation is resolved. •	Dogs can suffer sunburn too, especially those with light-colored hair. Purchase a dog-friendly sunscreen to protect your dog from peeling, redness and even cancer. Places that are prone to burning are the inside the nostrils, the tip of the nose, around the lips and the inside of ears for shepherds with standup ears. •	Avoid taking your dog to crowded summer events like concerts or fairs. The loud noises and crowds, combined with the heat, can be even more stressful and dangerous for dogs.